The most important principles of traditional music – the whole idea of variation, the whole idea of the personal utterance – are abandoned. Instead, everyone takes hold of a tune and belts away at it without stopping. The result is a rhythmic but meaningless noise with as much relation to music as the buzzing of a bluebottle in an upturned jam jar. Attitudes to céilí bands continue to be strongly divided between those who adore them and those who abhor them. Many in the latter camp even go so far as to assert that Seán Ó Riada’s notorious bluebottle analogy quoted above understated the degree of antipathy which these musical malformations should ought to evoke. In contrast, those supporting the bands argue that they played a major role in maintaining Irish musical traditions during the lean times and, moreover, ensured the continued popularity of set dancing in some areas. There were, to be sure, some pretty diabolical céilí bands in the past and, if you scour any charity shop in the UK, you’ll almost certainly encounter some charmless recorded example of their work. Times have changed, however, and there’s no question that the expertise of the leading bands’ musical arrangers has increased so dramatically that céilí band releases have almost become “listening” albums. The astute will have noticed the word “almost” in the last sentence above because, now matter how good a céilí band album is, whether any bears up to repeated listening is very questionable. That being said, this album by the Barefield CB is very good indeed. Their mentor and creator is the fiddler Denis Liddy who taught his then eight-year old pupils to play the whistle so they could perform at the Barefield National School’s Christmas party. The band took off from that point, winning the All-Ireland under-12s championship in 1998 and progressing to the extent that it gained the Senior title along the way, and playing in Toronto, Connecticut and Spain. Their first CD, Iolar, was released in 1998, followed by Flowers of the Burren four years later. 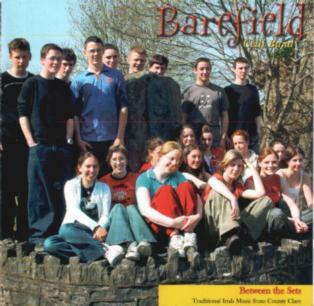 So, despite all still being in their mid-teens, the members of the Barefield CB could all be said to be hardy professionals when it comes to the recording studio. Equally, their obvious enthusiasm has been thoroughly channelled into the overall feel of Between the Sets and the tunes have an often infectious ebb and flow. The album is divided into two halves, the first consisting of the Caledonian Set and the second formed by the Plain Set. Each contains very familiar tunes, but neither suffers as a result. It’s also pleasing to note that the 20-strong band includes two uilleann pipers and no less than four concertina players, the latter offering an especial Clare flavour to the brew. For more information about the Barefield Céilí Band visit www.barefieldns.com. Seán Ó Riada Our Musical Heritage, The Dolmen Press, 1982, pp. 73–74.